Results from twelve years of the Text REtrieval Conference (TREC), documenting test collections, evaluation standards, and current best practices. The Text REtrieval Conference (TREC), a yearly workshop hosted by the US government's National Institute of Standards and Technology, provides the infrastructure necessary for large-scale evaluation of text retrieval methodologies. With the goal of accelerating research in this area, TREC created the first large test collections of full-text documents and standardized retrieval evaluation. The impact has been significant; since TREC's beginning in 1992, retrieval effectiveness has approximately doubled. TREC has built a variety of large test collections, including collections for such specialized retrieval tasks as cross-language retrieval and retrieval of speech. Moreover, TREC has accelerated the transfer of research ideas into commercial systems, as demonstrated in the number of retrieval techniques developed in TREC that are now used in Web search engines.This book provides a comprehensive review of TREC research, summarizing the variety of TREC results, documenting the best practices in experimental information retrieval, and suggesting areas for further research. 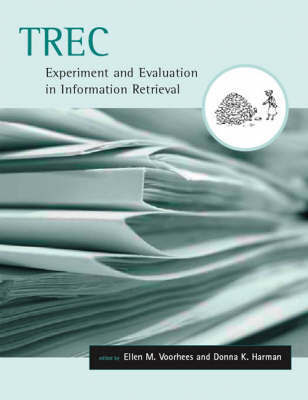 The first part of the book describes TREC's history, test collections, and retrieval methodology. Next, the book provides "track" reports-describing the evaluations of specific tasks, including routing and filtering, interactive retrieval, and retrieving noisy text. The final part of the book offers perspectives on TREC from such participants as Microsoft Research, University of Massachusetts, Cornell University, University of Waterloo, City University of New York, and IBM. The book will be of interest to researchers in information retrieval and related technologies, including natural language processing.